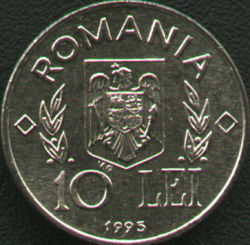 In 1995 the first Romanian modern day anniversary coin set was issued. Just like the later sets, this coins were not meant for circulation. 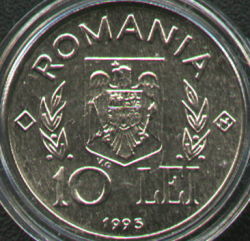 This set contains three coins sold together (a silver 100 lei piece and two 10 lei pieces) for a price of 36.000 lei (about 20 US$ in 1995). This 10 lei on the left, unlike the other, was sold in a plastic capsule and has as distinctive mark an N inside the right rhomb on the obverse - there is no telling what does this sign mean or if it has any meaning at all. A possible explanation is the one that the coins with N - that have a better quality than their sisters without N - were produced for numismatists. The coins without N were produced for circulation, but we did not find any proof of the coin's presence into the common change). 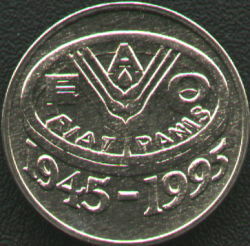 These coin were issued for the 50th anniversary of the establishment of FAO - Food and Agriculture Organization of the United Nations. The FAO logo comprises the acronym of the organization, a weat ear and the Latin expression FIAT PANIS, meaning "let there be bread".